This year six awards were given in four different categories. In addition, the Awards Committee chose to make two special commendations. Your editor reviews Drawn Together...in Art...in Love...in Friendships: The Biography of Caldecott Award-Winning Authors Berta and Elmer Hader, by Sybilla Avery Cook; Berta and Elmer Hader: A Lifetime of Art, by Joy Hoerner Rich, Karen Tolley, and John and Judy Waller; and Nicholas Gesner, 19th Century Farmer, by Alice Gerard. A new Historical Society marker sponsored by Douglas House, Inc., commemorating the naturalist John Bell, was erected in front of the house Bell once owned on Kings Highway in Sparkill. COVER PICTURE. 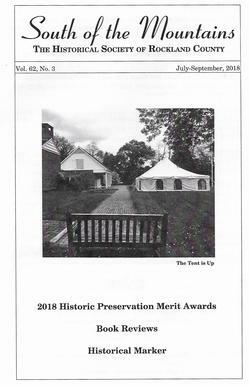 The buildings and grounds at the Jacob Blauvelt House Historic Site are ready for the Historic Preservation Merit Awards Country Supper on May 20. Photographed by Clare B. Sheridan. South of the Mountains is one of the tangible benefits of membership in the Historical Society of Rockland County. For more information on membership, click here: http://www.rocklandhistory.org/product.cfm?category=17. Back issues of South of the Mountains, from 1958 through 2013, are digitized and can be viewed at www.hrvh.org. A direct link can be found at www.rocklandhistory.org under "Collections." The editors welcome contributions of letters and articles. Please con­tact us at the Historical Society.